A violin method for children. By Egon Sassmannshaus; Kurt Sassmannshaus. American English translation: Kurt Sassmannshaus; Illustrations: Charlotte Panowsky. For Violin. Take advantage of our exclusive introductory offer now and save 25% off the regular price - this special price is available for a limited time only. Baerenreiter's Sassmannshaus. Original German title: Fruher Anfang auf der Geige - Band 4; Eine Violinschule fur Kinder. Instructional Method. Method book. Text language: English. 72 pages. Published by Baerenreiter Verlag (German import). ISBN M006536436. The fourth volume introduces various positions as well as new bowing techniques. These are practiced in increasingly demanding classical duets. From here students can embark on the journey of standard repertoire - Concerti such as Vivaldi, Accolay etc. are now within reach. Children playfully learn reliable violin technique at the earliest age. 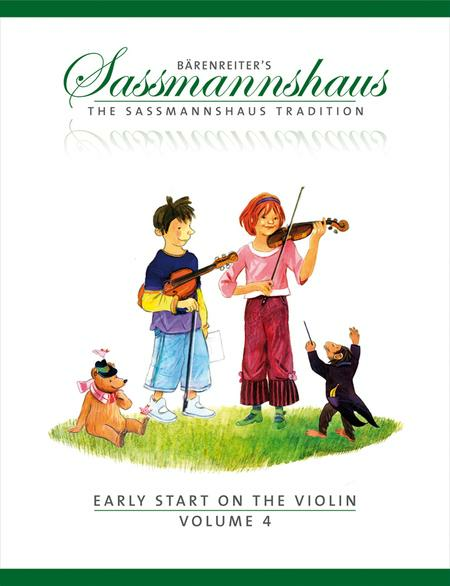 For more than three decades the Sassmannshaus Tradition has been the household name for excellence in beginner violin methods in German-speaking countries. More than half a million students have successfully learned to play the violin using this publication. This tried and tested German violin method is now available in English! The best-selling violin method that gave generations of European musicians their foundation is now available in English, with content and songs newly adapted for today's English speaking children. What makes this violin method so special? Note reading is emphazised from the first lesson - children are brought up to become proficient sight-readers and play in chamber music ensembles as early as possible. In contrast to other beginner violin methods, The Sassmannshaus Tradition progresses swiftly by introducing advanced violin techniques in rudimentary form, such as shifting and varied bow strokes.